My sister, Penny, and I were nine and eleven the summer of 1950, the summer our father, Dan, decided that we should see what the tourists see. He was, I suppose, thinking about how native New Yorkers supposedly never visit the Empire State Building. 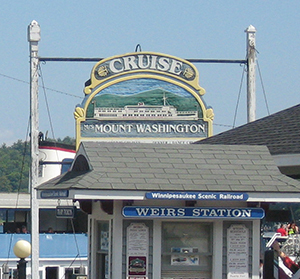 (Photo: Weirs Station, home of the cruise ship "Mount Washington") These places were free. But once in a while we swooped up to the top of Cannon Mountain on the Tramway, the skiers’ cable cars used by sightseers in summer, and that cost money. And money defined what Dan had in mind that summer we played tourist. We went to places you had to pay to see. What I remember most vividly are the two that involved caves and claustrophobia. Penny remembers how cold the granite Polar Caves in Rumney were as she and Dan happily explored them. Mainly I tried not to panic. In North Woodstock’s Lost River Gorge and Boulder Caves I finally rebelled at one cave called, if I’m remembering correctly, the Lemon Squeezer. It won’t surprise you to learn that this usually means food. (Photo: Town Docks Restaurant) As you know, Don grew up in the Weirs, the honky-tonk section of Lake Winnipesaukee’s shoreline. Thus he lived smack in the middle of the tourist business, of which his grandmother was a part, with her boarding house and cabin colony. To get the money to play tourist, he did chores at his grandmother’s and also searched under the boardwalk for dropped coins or for the littered bottles that he could turn in at the grocery store for the two-cent deposit. With this money he bought ice-cream cones, but he never could afford the most expensive treat that tourists bought, fried clams. So one year after he was all grown up, when we played tourist in the Weirs we bought fried clams. 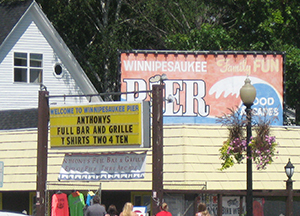 (Photo: The pier at the Weirs) A few years ago Don and I played tourist at the Town Docks Restaurant in Meredith, and we did again this year. 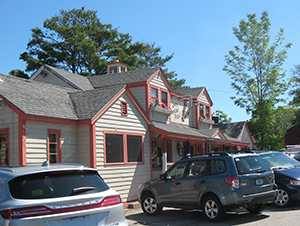 An old summer restaurant beside the docks has been added to New Hampshire’s chain of Common Man restaurants, each of them distinctive. 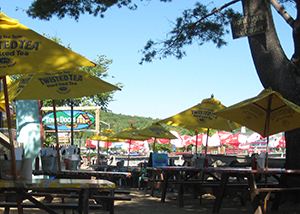 At the Town Docks you can sit indoors—or outdoors at picnic tables on the sand, under yellow umbrellas (advertising Twisted Tea). The music is loud, but the summer people don’t seem to mind, nor do the ducks that waddle around scavenging. We had seafood again here: lobster roll, crab cake. By chance, I was wearing a Sedona T-shirt, and, realizing this, I hoped the waitress thought we were from Arizona. She brought the bill clipped to a (new, clean!) flip-flop. We always stop at least once a summer at the Red Hill Dari in Center Harbor on Route 25, where exhaust fumes mingle with the smell of French fries. We sit at one of the white plastic tables, have hot dogs or soft-serve ice cream, and look and listen. The highlight this summer was a guy wearing a T-shirt that said, “Honk If You’ve Never Seen a Gun Fired from a Motorcycle Before.” Well, if that got a laugh from us, it was appalled laughter. 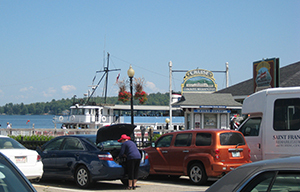 The Lake Winnipesaukee town of Wolfeboro, which claims to be America’s oldest summer resort, is thronged with summer people and we usually steer clear, but this summer we found ourselves there—and to our astonishment we found a parking place on their town dock, right next to a little restaurant that Don remembers from his childhood. His other grandmother owned first a Wolfeboro inn and then a very nice lodge with cabins on the lake. Before we had lunch at that Dockside Grille (and decided on splitting the fried shrimp platter), we walked along Main Street and I dragged Don into a clothing store so I could browse amongst the tourists while he fainted at the prices (“Seventy dollars for a SWEATSHIRT?”). There was a television set to which I didn’t pay any attention until I realized what I was hearing. A commercial for Polar Caves. And I was right back in that summer of 1950.